On the 7/2/2017 new laws governing the Bulgarian penitentiary system came into force as they were published in the government state newspaper. Although there is still a lot of work to do and no one sees the reforms as a silver bullet to the problems facing the Bulgarian prison system, the reforms are still massively progressive. 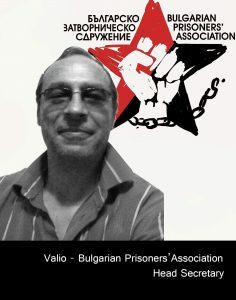 The Bulgarian Prisoners’ Association is proud to boast that we partook in the drafting of the legislation and the public discussion periods with Valio Ivanov representing the Prisoners’ Association both in the Ministry of Justice and presenting our proposals and comments to the Commission for Legal Questions (Комисия на правни въпроси). The reforms were a one, two punch, with the first punch coming from many prisoners over the years swamping the European Court of Human Rights (ECHR) with complaints about human rights violations within the Bulgarian penitentiary system. Undoubtedly the prisoner who submitted the most complaints for human rights abuses to the ECHR was Svetlomir Neshkov (Светломир Нешков) and his work fighting for his and the rights of other prisoners resulted with the ECHR releasing a mega court ruling against the Bulgarian penitentiary institution. The mechanism used by the ECHR was in the form of a ‘Pilot Decision’ called “Neshkov VS Bulgaria”, who’s purpose is not simply to compensate already committed violations by states but to prevent further violations from occurring due to systematic flaws, primarily through wrong or unclear laws that lead to abuse by the prison administrations and also the Bulgarian courts and the court system that handles the legality of said violations. 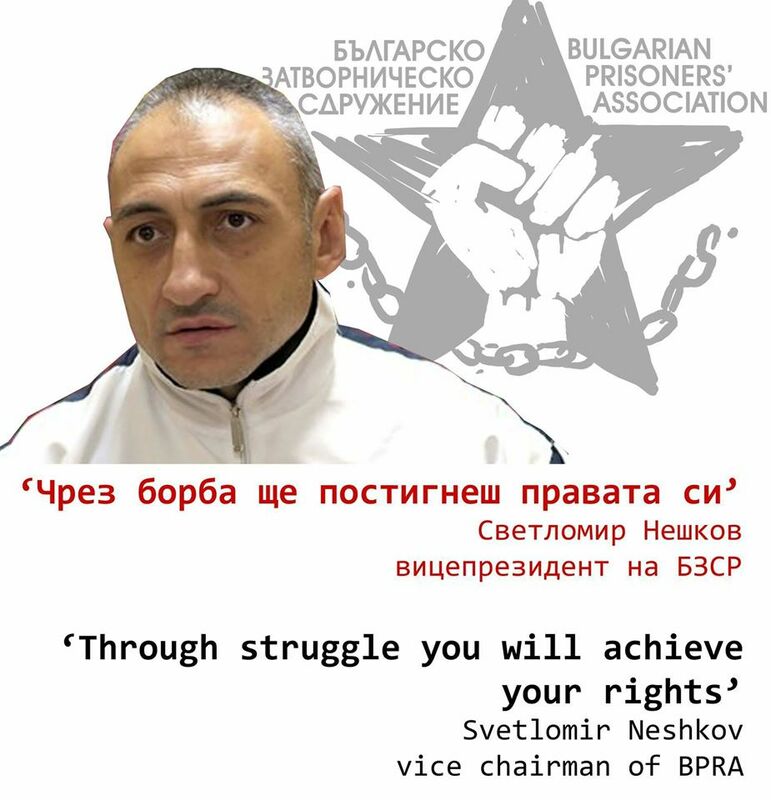 The Bulgarian Prisoners’ Association is proud to now be able to claim Svetlomir Neshkov amongst her ranks. Neshkov will be taking a position on the Council of the Association as Vice-Chairman. It was Svetlomir Neshkov – (a current prisoner), who made the first punch and brought the Bulgarian state to the legal understanding that reforms were needed categorically. The second punch in the combination were how the reforms would be drafted and how they would look. Of course the reforms were only going to reflect the problems as were known to the Ministry of Justice, and it was then that Valio Ivanov the Head Secretary of the Bulgarian Prisoners’ Association was instrumental in delivering the second punch. One of Valio’s main roles as representative of the Prisoners’ Association was to enlighten the Ministry of Justice as to the nature of the problems both in legality and in practice. It was clear that the Head Directive for the Fulfilment of Punishments (ГДИН) would not reveal the nature of the problems within the penitentiary system as it is the Head Directive and the staff within the individual prisons that benefit from the lack of laws guaranteeing the human rights of prisoners. 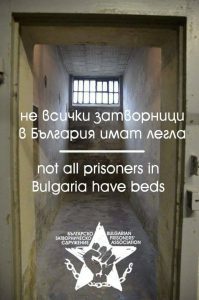 It was in the favour of the Bulgarian prison institution to misinform the Ministry of Justice as to the real nature of the problems facing the Bulgarian penitentiary system. Valio smashed the wall of silence and for the first time in remembered history the prisoners’ voices were heard. It must be said that the reforms to the penitentiary laws still leave a lot more room for ongoing improvements and further reforms. But that being said the point of this text is to note what has progressed rather then to highlight ongoing violations of the human rights of prisoners. One of the most major reforms is for the first time a legal minimum living space per prisoner of 4m2 previously there was no minimum living space whatsoever. According to the old laws there was no overcrowding problem as there was no designated capacity per prison or cell. 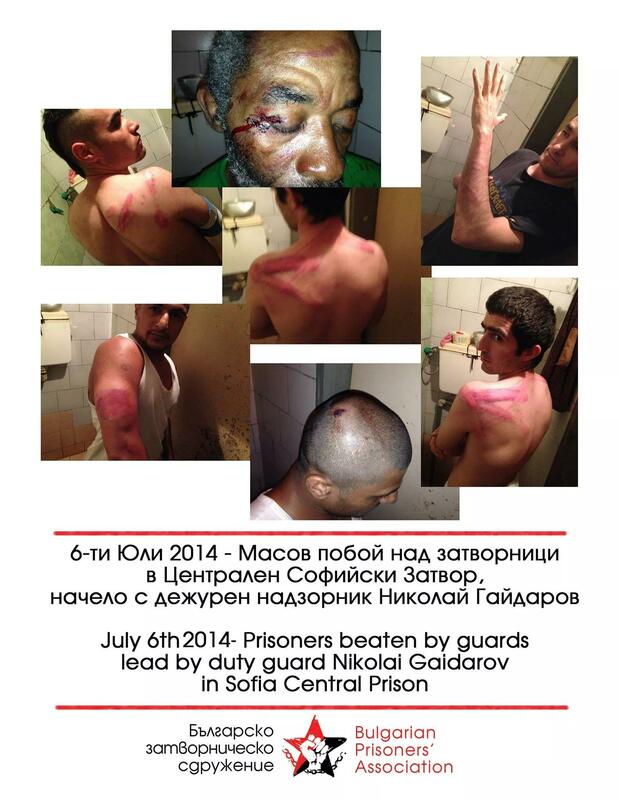 Without having the official statistics a rough estimate is that Bulgarian prisons are 3 times over their capacity. With cells made for 1 person having as many as 5 or 7 prisoners inside, meaning 1 or 2 prisoners have beds and everyone else sleep on the floor. Unlike previously prisoners will now be able to seek parole (early release) from the court. Previously only prison administrations could propose prisoners to the courts to have a parol request heard. This lead to mass corruption with prison administrations forcing prisoners to pay bribes simply in order to have their request for parole heard by a judge. Even if corruption wasn’t a factor prison staff were often scared to take the initiative and responsibility for proposing prisoners to the court for parol as it became de facto a request from the prison Director to release said prisoner and not the prisoner him/herself requesting parole. Previously the Director asked the courts to grant early release to prisoners and the prisoner was not a participant in the proceedings, but rather only a witness in the proceedings between the prison Director and the court. The roles have now changed, and now prisoners can give their requests and defend themselves as the initiators of the legal request and the prison Director and staff become witnesses as to the behaviour of the prisoner during his/her time in prison. Unlike previously prisoners will have the right to legal representation and in the case of a refusal prisoners will now have the right to appeal the refusal. The granting of parole now is to be based on a more clearer criterion. Previously the law for early release (parole) was so vague that it lead to mass abuse by ruling judges and lead to the most absurd of arbitrary rulings where prisoners with 10 years left of their sentences were release but others with 1 month were refused early release on the grounds that the prisoner had too much time left of his sentence. Now the courts are obliged to judge a prisoner according to already existing laws governing how a prisoner should de serving his/her sentence. As parol was previously so arbitrary, the prison administrations almost never fulfilled this part of their duties, to lay out a course for rehabilitation and gradual progression though the system because the prison administration simply refused to progress prisoners at all. Prisoners with a life sentence (with the possibility of remission) can now themselves request remission from the courts. Previously only the prison Director or Prosecutors could propose a lifer to court to have his/her sentence changed to a 30 year sentence. The same standards apply as before, that a prisoner with a life sentence (with the possibility of remission) can ask for the change to a 30 year sentence after s/he has served over 20 years in prison. The difference now is that the prison and the prosecutor can’t interfere with access to the court. It wasn’t the prison Director or the Prosecutor who granted remission, they simply granted access to court where the question would be analysed and judged. Unfortunately there are very few changes if at all for prisoners who have the illegal life sentence (without the possibility of remission). One progressive change is that prison Directors can now lessen the security measures on a prisoner with a life sentence after 1 year of the strongest possible regime, previously a lifer had to serve a minimum of 5 years in the strictest of regimes before it was possible for the regime to be lessened. Prisoners can no more easily be moved to “open” prisons. Previously a prisoner had to have less the 5 years remaining of his/her sentence to be eligible to move to open style prisons, or light regime prisons. When prisoners had large sentences the entire system was backwards. Prisoners could be released after serving half of their sentence but unless they had less the 5 years remaining they couldn’t go to an open prison. A prisoner with a 20 year sentence for example could be released after 10 years of prison, but would have to serve 15 to be eligible for an open prison. Of course this made a mockery of the gradual progressive principle of the prisons. New definitions of what ‘inhumane treatment’ have been added and an entire new chapter has been formed to specifically address claims of maltreatment and inhumane conditions by the courts. Previously prisoners had to sue for damages according to the general law for claims against the state. This law is designed for people who can freely collect evidence, IE not for prisoners. With the new chapter there are some concessions on behalf of the state with regards to collecting evidence and it not only gives the court to grant compensation but also to intercede in the running of the prison if the court needs to prevent systematic or ongoing violations of rights. 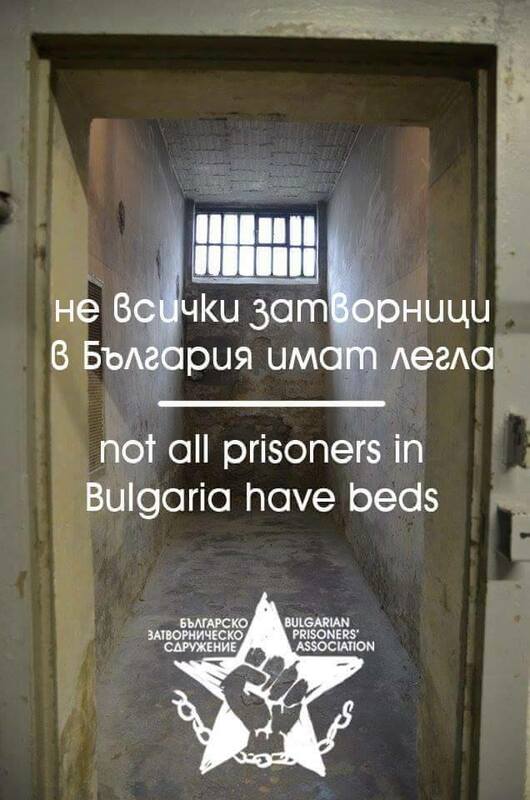 It has been a successful 2 years for the Bulgarian Prisoner’ Association and we would like to thank everyone who donated time and money to the cause of reforming the Bulgarian penitentiary laws and also for helping to defend the rights of prisoners who had their rights violated. It absolutely wouldn’t have been possible or continue to be possible without all of your support! These reforms mark a massive progress in Bulgarian penitentiary legislation. If all of in the BPRA and the supporters could get together in one place, now would be the time we would have a big victory party. Obviously this is possible as many of us are in prison or in foreign countries. We just have to be happy knowing that we have improved the lives of prisoners in Bulgaria and that we have shown that working together a relatively small group of people can make a massive impact. It will be interesting and exciting to see what the BPRA will achieve in the years to come.